Hi, I am interested in your 1987 Mazda RX-7 (stock #19GKM24) listed on Autotrader for $8,900. I'd like to get more information about this vehicle and confirm its availability. One Family owned since new - 65k Miles - 5 Speed Manual - Power Steering - Power Windows - Cruise Control - Factory Air - Recent Service - (Please note: If you happen to be viewing this vehicle on a website other than our main website, its possible that only some of our many photographs of this car are presented due to website limitations. To be sure you access all the photographs, please go to our main website: Garage Kept Motors.) 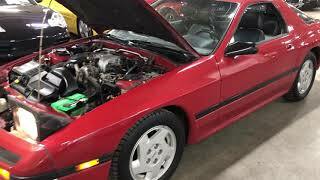 1987 Mazda RX-7 GXL - Family Owned Since New On February 27, 1987, Robert Carl Hoffman of Jenison, MI purchased this car new at Borgman Mazda, Inc. Mr. Hoffman was a BMW mechanic by trade and a raced old MGs on the weekends, yet chose this Mazda as his leisure driver. He was a avid member of the Sports Car Club of America and worked his way up to a racing official for road rallies. Unfortunately, a brain tumor took his life in 1997. His father took possession of the vehicle until he passed in 2010. Today, Roberts sister owns the vehicle and has decided someone else should enjoy the car as Robert did years ago. From the factory, the car was finished in Royal Maroon Metallic with an upgraded factory Leather Package interior. It is powered by Mazdas legendary 1.3L/146hp Rotary engine mated to a 5-Speed gearbox. These are quick and nimble cars that are a blast to drive. This car has power steering, power windows, cruise control, pop-up headlights, AC, and upgraded plush floor mats and center arm rest. It has just been fully serviced with a new battery, oil change, air filter, clutch slave cylinder and master cylinder. Turn-key and ready to go for its new owner. The car comes with the original window sticker, original books, original owners manual, and original warranty booklet. Clean CarFax, no accidents, non-smoker. This is an awesome RX-7 with all ownership history and 65k original miles. A great classic example at a very reasonable asking price. Be sure to check out all the photos and video on our main website: Garage Kept Motors. Call if interested or e-mail with any questions. Thank you for looking.